Hey all! 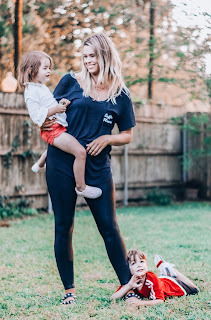 I'm popping in for a quick life update because it's been a hot minute since I've talked about anything outside of shopping on here! First things first... we are still living with my mom! Which is still going well, but obviously not quite as nice as having your own place. Also on the subject of houses, we are potentially switching gears from building our new home to buying a fixer upper. (But not a major project.) I'll update you more on that when things become more final. With this blog business, I've been taking on a few fun projects that I'm really excited about! I recently started working with our local Children's museum doing promotional posts and full Instagram takeovers to give live coverage of their bigger events. This past weekend was all about their first annual Duck Derby fundraiser. It was tons of fun and you can check it out HERE. I'm also in talks to participate in another blogger crawl at my favorite local shopping center. The last one was such a great experience and this one seems like it will be even better! Now, onto today's post! 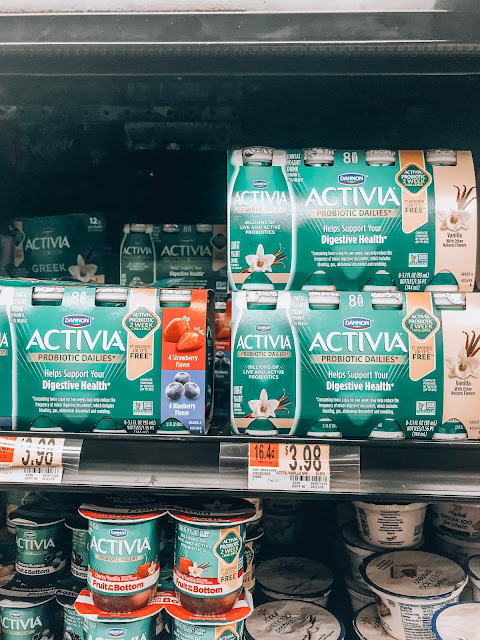 I teamed up with Activia to outline a few ways I'm trying to keep my life balanced and in check while our living situation is a little out of the norm and very busy. I'm sure it's no surprise that being stuck in a small bedroom with my husband and sharing a home with two young (loud) children and my mom isn't the best environment to find quiet or alone time in. It was a bit of the struggle in the beginning to fit in Me time. Lately I've been finding refuge during my daughter's bed time routine. She likes to have me stay with her until she falls asleep. Which can take a while. So I've taken to reading my bible under a small book light while I sit next to her bed. It kills two birds with one stone. And sitting in the dimmed room with her sound machine on is actually kind of relaxing! I'm also continuing to visit my counselor every few weeks as I mentioned in a previous post HERE. Between running kids around between summer camps, trying to get our old condo ready for market and meeting deadlines for the blog I haven't been as motivated or available to eat well or head to the gym. The number of times we've eaten out or ordered pizza this month is pretty shameful. Fitness: I've essentially been donating $80 to my gym every month, since I haven't been there in ages! So when the kids are playing outside I try to go out with them as much as possible. We just introduced Hudson Flag Football which has been a good way to work up a sweat. I also love to search YouTube for 10 - 15 minute workouts that can be done at home! Diet: As I said, Pizza has been in regular rotation around here. And when snack time comes around it's been a lot of chips and candy.... I'm basically living like a college student. Without the high metabolism or lack of acid reflux. So lately I've been trying to stock up on healthier options that are easy to take on the go. Nuts, Fruit and Pre packed salads for work. When my sweet tooth hits me, I have a secret stash of chocolate chips. I grab a few to satisfy my craving without over indulging in a full on candy bar. 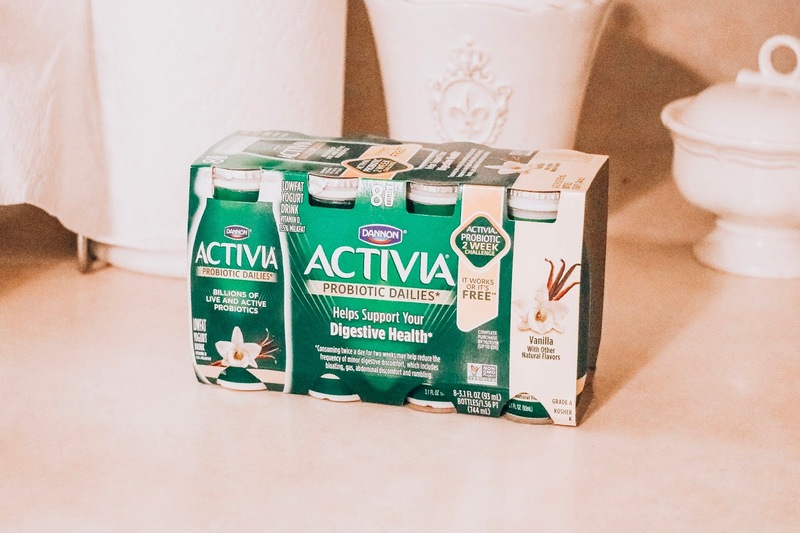 To help balance it all out, I also started the Activia Dailies two week challenge! So far, I've actually been pleasantly surprised. In combination with the other lifestyle changes, I feel a lot better. 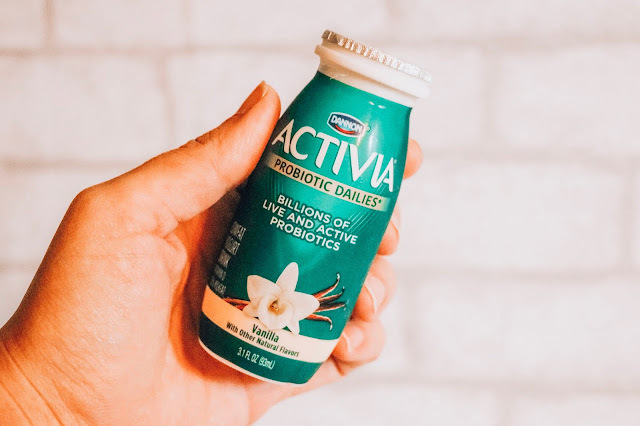 The new Activia Dailies are a small yogurt drink packed with billions of live and active probiotics! Since I've started drinking them, things have been a lot more..... um.... regular? I'll just leave it at that. But overall having my gut health in check makes the rest of my to do list a lot easier and more comfortable! They also taste great and are easy to consume quickly twice a day! So, the moral of the story is Less Pizza; More Activia! And right now you can try them out with a $1 rebate from ibotta by clicking HERE. What things do you do to stay calm and balanced when your life circumstances are out of the norm? I would love to hear more in the comment section, or feel free to DM me on Insta/Facebook! Especially if you have experience living with parents!